UNITED NATIONS, August 9, updated -- The Security Council turned to Libya in a closed door session Tuesday morning, when China and other members criticized NATO's bombing of state television there, purportedly under the authorization of Council resolution 1973. Since under that resolution UN Secretary General Ban Ki-moon was given a "coordinating" role, Inner City Press Tuesday at noon asked Ban's acting deputy spokesman Farhan Haq what Ban thought of NATO's bombing of Libyan TV. Haq replied in part that Ban "believes that resolution 1973 has been used properly in order to protect civilians in Libya.". But, as was being asked in the Council's closed door consultations, how does bombing a TV station, in violation of conventions, protect civilians? Haq said the Secretariat would "need further details about what the operations that were conducted involved." But these operations took place days ago, and have been reported on. What was that, about Ban coordinating and even providing safeguards on actions under Resolution 1973? Haq said, it is being discussed in the Council. But what about Ban's role, if not leadership? Watch this site. Footnote: Inner City Press asked a well placed source in the Council's consultation if any member had invoked Radio Mille Collines in Rwanda as a precedent for bombing Libya TV. 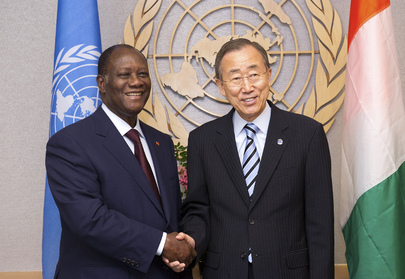 Cote d'Ivoire's Ouattara recently cited the station in connection with the probe of a pro-Gbagbo journalist. We'll see. Update of 12:50 pm -- Inner City Press asked Brazil's Deputy Permanent Representaive what Brazil thinks of NATO's bombing of the Libya TV station. "We do not approve," she said. Update of 1:21 pm -- Inner City Press asked the Deputy Perm Reps of Lebanon and then Germany for their countries' views on NATO's bombing of Libyan TV. Lebanon's DPR said her country supporters freedom of the press, notes that Resolution 1973 is for the protection of civilians; she got information today and will be seeking more. Germany's DPR said Germany will wait for NATO's investigation, that his country is a member of NATO but not of the coalition. He noted that at times media can incite violence against civilians. So again we ask: did anyone explicitly cite Radio Mille Collines of Rwanda? Update of 1:38 pm -- Inner City Press kept asking about NATO's bombing of Libyan TV. Bosnia's Perm Rep said waiting for more information, so no comment. Inner City Press asked Council president for August Hardeep Singh Puri about the Libya discussion and the TV bombing. He said it was in consultations, that UNESCO's (back-dated) statement was brought up, and that he would leave it there for now. He reiterated India's overall position, abstaining on Resolution 1973. Russia's Vitaly Churkin told Inner City Press he has raised it, as well as bombing of radar at the Tripoli airport, oil and other installations. He too references the NATO investigation. But how will its results be reported to the Security Council? We will continue on this - watch this site.